Haven’t decided on a hotel yet? You can look at other available hotels in the regions of Styria and Burgenland with Booking.com. Austria’s second largest province, Styria (Steiermark in German), includes mountain ranges, deep forests, vineyards, and grasslands. Austrians enjoy the region for its hot springs, wineries, ski slopes, and traditional life. A thousand years ago, medieval metal smiths forged the rich iron ore of Upper Styria into weapons and armor, much of which you can see today in regional museums. In the Middle Ages if you traveled through Burgenland, you were probably a Roman, Magyar, Turkish, French, German, or Russian soldier marching as part of an invasion force. This region has been fought over so brutally and for so long that after the Turkish invasion of 1529, settlers from Croatia were brought in because nobody was left. Two thousand years ago, settlers came here for one of the world’s most precious commodities—salt, from which the province and city take their names. The province developed into an independent principality governed by a powerful archbishop, who, depending on the political winds of the moment, allied the province with Rome, the Habsburgs, or the Holy Roman Empire. Salzburg was awarded to Austria following the Congress of Vienna in 1815. Graz The historical city center of Styria’s capital is a UNESCO World Heritage Site. Eisenstadt Now the capital of Burgenland, Eisenstadt was once the home of Austrian composer Franz Josef Haydn. His patrons, the Esterházy princes, were a powerful Hungarian family who ruled over Eisenstadt from their home at the baroque-style Schloss Esterházy. The Castle Road (Schlossstrasse) Over a dozen mighty fortresses perch on hilltops along the border of Burgenland and Styria. Each has a distinct personality and a present-day reincarnation as museums, concert venues, and hotels. Burg Forchtenstein Built in the 14th century and still in the hands of the Esterházy family, Forchtenstein is one of Burgenland’s most famous castles. Neusiedler See Breeding ground for over 250 bird species, Europe’s only steppe lake has no natural outlet. An ideal recreation area for water sports enthusiasts, bird watchers, and bicyclists. Rust Famous for its rooftop storks and outstanding wine, Renaissance and baroque façades grace the houses of this charming village along the shores of Neusiedler See. 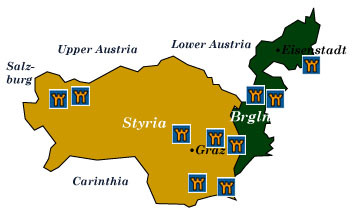 Styrian wine routes (Weinstrassen) Sample the local vintages along well-marked wine routes. A booklet from the Styrian tourist office has complete information. Piber Stud Farm The snow-white Lipizzaner stallions that perform at the Spanish Riding School in Vienna are bred here. Mariazell Founded in 1157, this important pilgrimage center has had several miracles attributed to the Virgin of Mariazell.